And now, the second side of the disc heard in our previous post. From the same group of discarded lacquers that originated at WHBC in Canton, Ohio, comes this air check of WATG-FM, probably from its first days on the air in May 1947. This side of the disc, titled “Music Fair” starts off with some light music performed by solo violin and later an organ with harp and strings. The sound is overmodulated and I’m not sure if that’s because of the recording or the way the program was broadcast. Finally near the end of the recording, we hear a station ID for WATG, “North Central Ohio’s first frequency modulation station”; an ad for Ashland Jewelry, congratulating the station; and a time check. Then we hear an announcer just start a mid-day news broadcast. Our mp3 was transferred from a ten inch Audiodisc lacquer cut at 33 1/3 rpm. This is the final disc that I have from the group of WHBC, Akron, Ohio lacquers. Finally this week, we have an unusual aircheck that came from the same group of “throw away” lacquers that originated from WHBC in Canton, Ohio. This disc includes two excerpts from FM station WATG-FM in Ashland, Ohio. 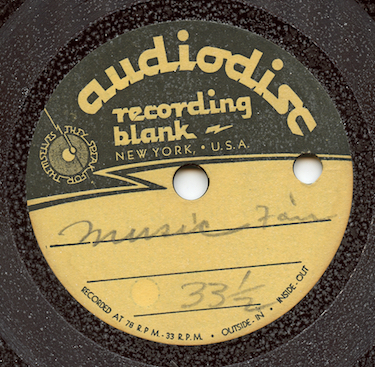 This side of the disc is dated May 13, 1947. According to Wikipedia, WATG-FM went on the air on May 18, 1947, so perhaps this is a recording of some kind of test broadcast from the station or the date on the article is incorrect. The aircheck starts off with an upbeat boogie boogie-style number from a small combo. An announcer introduces a request for Omar Moore of Orville, Ohio, who says “everything is coming in fine”, Joe Mooney and his Quartet performing “Tea for Two”. In the middle of the record, the announcer notes that Moore is receiving the signal without an antenna. Another request for a Charlie Spivak number and Perry Como. The recording ends with another unidentified boogie boogie recording. Our mp3 was transferred from a ten inch Audiodisc lacquer cut at 33 1/3 rpm. Our next post features the other side of the disc.